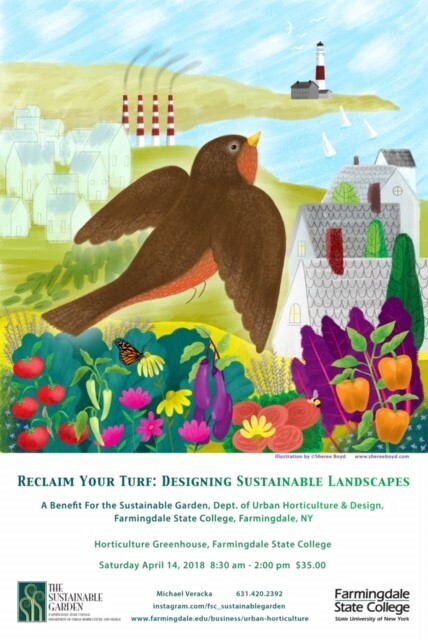 Spring is here and the Department of Urban Horticulture and Design at Farmingdale State College invites you to attend the 6th Sustainable Garden conference on Saturday April 14, 2018. This year’s event – entitled Reclaim Your Turf: Designing Sustainable Landscapes — will be held in our greenhouse complex from 8:30am – 2pm. Regional speakers will discuss topics or demonstrate techniques relating to the themes of the department’s Sustainable Garden. All of the specifics, including the exact agenda, presentation topics and speaker bios, can be found in this PDF flyer. Admission to the conference is $35.00, free for members in good standing, and includes a continental breakfast and lunch. To preregister for the event, at the special rate of $30.00, please send your check (made out to ASC – the Sustainable Garden) directly to: Michael Veracka, Department of Urban Horticulture & Design, Thompson Hall, Farmingdale State College, Farmingdale, NY 11735. Preregistration ends on April 9th. Spring is well underway, our academic year about to end, and the Sustainable Garden at Farmingdale State College is presenting several upcoming workshops of interest to gardeners. Many people are interested in growing a portion of their own food but have limited or no access to land. No problem, there is a solution in sight! This presentation will show you how you can produce a portion of your own food utilizing a vertical hydroponic system that is versatile, mobile and allows you to bring live produce to your table year round. Growing vertical food produces two times the amount of food in half the amount of space, while using less resources. When you incorporate such a system you can help promote a more sustainable and local food production system. Presenter bio: William Turano first discovered the impact of large-scale industrialized agriculture in 2013 while taking an anthropology course at Suffolk County Community College. Around the same time he began turning what began as a gardening hobby, into a small-scale organic farm. At that point he knew that he wanted to grow food and help feed the world. William’s business, Lifted Roots Vertical Farms (www.liftedroots.net ), provides consumers with fresh, healthy and sustainable grown produce. His indoor hydroponic farm uses 95% less water compared to traditional farms, and is an almost carbon neutral operation. Harvesting rainwater provides an alternative to using potable drinking water for gardening and other home uses. In this workshop you will learn practical methods to capture a portion of your own water for landscape applications. You will learn tips to save money by reducing household water usage and keep your plants healthy with non-chlorinated rainwater. Collecting rainwater on your site reduces flooding and pollution to local streams, rivers, and lakes. Presenter bio: Mark Scaramucci is the principal owner of Permascape Designs (http://www.permascapedesigns.com ). A certified permaculture designer, Mark’s ecological design practice creates functional, interdependent systems serving both nature and its living habitats. His work focuses on storm water management, indoor/outdoor air quality and energy-use reduction. All workshops take place rain or shine on Wednesday evenings from 6:30 – 7:30 pm. As is our custom, all events are preceded with a potluck dinner (5:30-6:30 pm). Please bring a dish to share. The meeting location is the Kiosk at the Sustainable Garden, a component of the Department of Urban Horticulture & Design Teaching Gardens. Please bring your own chair too! 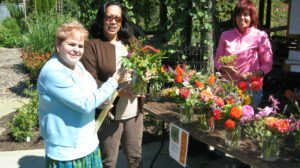 These workshops kick off an exciting summer season of events (workshops, lectures and potluck gatherings) in the garden. More events will be added soon! We hope to see you at an upcoming event! And don’t forget about our department’s annual spring plant sale that takes place in our greenhouse May 9-11th from 9am to 5pm! Spring Is Here! A New Season of Workshops! Spring is fast approaching and the Sustainable Garden at Farmingdale State College is presenting several upcoming workshops of interest to gardeners. All workshops take place rain or shine on Saturday mornings from 9am -11am. The meeting location is the Kiosk at the Sustainable Garden, a component of the Department of Urban Horticulture & Design Teaching Gardens. These workshops kick off an exciting season of events (workshops, lectures and potluck gatherings) in the garden. We hope to see you at an upcoming event! Posted in UncategorizedLeave a Comment on Spring Is Here! A New Season of Workshops! The 6th annual Sustainable Garden Conference will take place in late winter or early spring, 2017. As always, the conference will feature an array of regional and national renowned speakers lecturing on a variety of sustainable landscape design and horticultural topics. Please check back frequently to these pages for all the latest news regarding the theme of the conference, exact dates, speakers and fees. The Plant Sale at Farmingdale State College is a must for all Long Island plant lovers. Support local horticulture students & the wonderful Teaching Gardens by attending our 2015 event! What: Wide variety of flowering annuals in flats, pots & baskets. Many Farmingdale-grown veggies, herbs, perennials, tropicals & house plants. Lots of unusual varieties! 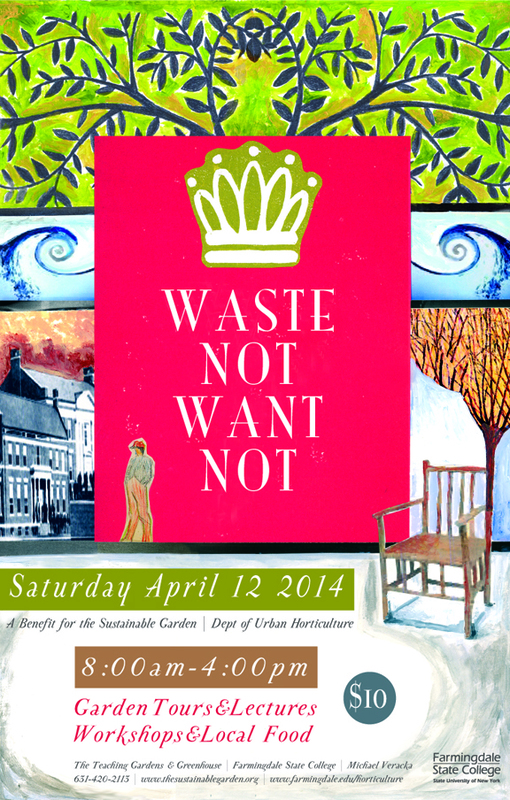 Waste Not Want Not — April 12, 2014 — our Next Event! 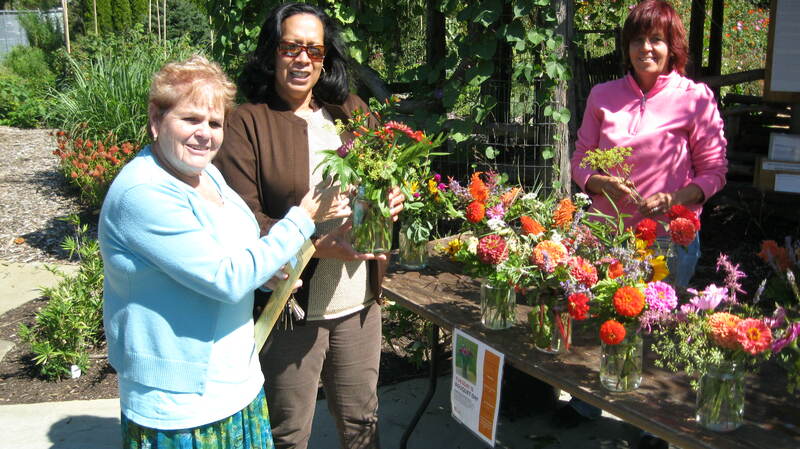 On Saturday, April 12, Farmingdale State College’s Department of Urban Horticulture and Design will host “Waste Not Want Not.” This educational day runs from 8:30 a.m. to 4:00 p.m. at the college’s Teaching Gardens and Greenhouse. The public is invited to support The Sustainable Garden of the Department of Urban Horticulture and Design through the $10 admission fee. This is the first major event hosted by the department since changing its name to Urban Horticulture and Design. Urban Horticulture speaks to the program’s location within the New York City metro area and its unique mandate to address horticulture in the context of challenges and opportunities indigenous to this environment. The Field Day will also feature a CSA Fair (10 a.m. – 2 p.m.) garden tours, plants for sale, a variety of vendors, and local food. CSA stands for Community Supported Agriculture. There is no admission fee for this section of the Field Day. “Waste Not Want Not” is held in conjunction with Farmingdale State College’s Open House which offers potential students an opportunity to tour the campus, and talk with students and faculty. And for students interested in horticulture, one of the college’s earliest and most distinguished programs, the Field Day will answer any and all questions. 9:45 a.m.: Take a break by walking through the vendors and see all there is to offer. Visit the CSA Fair and sign up for fresh produce throughout the season. The history of the horticulture program at Farmingdale State dates to the founding of the institution as an agriculture school over 100 years ago. Long Island’s agricultural roots have been masked by suburban sprawl and our local area is now best viewed as an extension of New York City complete with the challenges and opportunities endemic to urban landscapes. The department no longer views horticulture as a movement based solely on aesthetic improvement. The true challenge is to marry the discipline with contemporary trials faced by urban areas such as limited resources, environmental degradation, paucity of locally grown food and the difficulty of beautifying a complex environment while improving the lives of its residents. All “Waste Not Want Not” activities will take place at The Teaching Gardens and Greenhouse Complex, conveniently located adjacent to the Smith Street/Rt. 110 entrance on the Farmingdale State College campus. For more information about The Sustainable Garden, go to www.thesustainablegarden.org. For further information about the college’s Department of Urban Horticulture and Design, go to www.farmingdale.edu/horticulture. Posted in UncategorizedLeave a Comment on Waste Not Want Not — April 12, 2014 — our Next Event! On Saturday April 12, Farmingdale State College’s Department of Urban Horticulture and Design will host “Waste Not Want Not.” The event runs from 8:30 a.m. to 4:00 p.m. at the Teaching Gardens and Greenhouse at the college. The public is invited, and the $10.00 admission will benefit the Sustainable Garden at the Department of Urban Horticulture and Design. 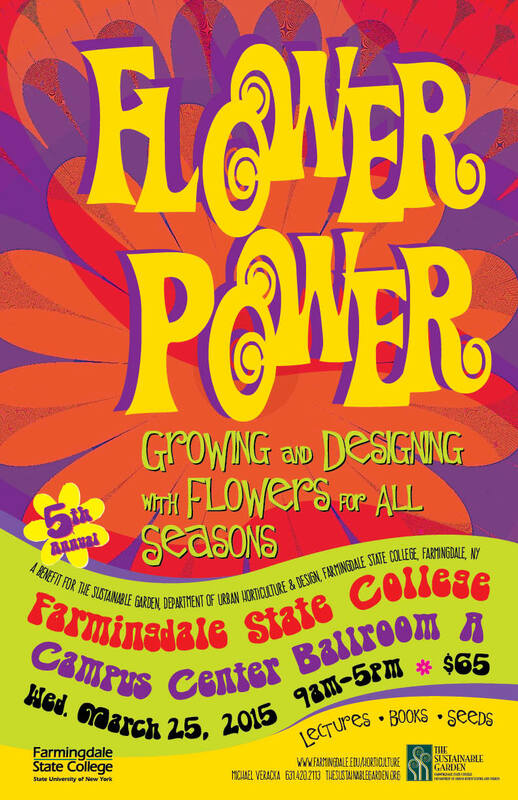 This event coincides with Farmingdale State College’s Open House and celebrates the remarkable resiliency of the Department of Urban Horticulture and Design, a founding program of the college. The event will also feature a CSA Fair (10:00 am – 2:00 pm), garden tours, plants for sale, a variety of vendors, and local food. Presenter: Lucie Searle, Real Estate Developer, Providence, RI and Vice President of the Board of Trustees, Providence Preservation Society. Description of Presentation: Hicks Hall, originally the “Horticulture” building and Cutler Hall, the “Agronomy” building, date back to 1914, the early founding years of today’s Farmingdale State College. These turn-of-the century classically styled buildings, now vacant and in disrepair, represent an unusual opportunity to celebrate Farmingdale’s roots and to provide extremely attractive 21st century facilities by a thoughtful restoration and re-purposing of these two stately structures. Using a number of examples of completed projects, Ms. Searle will explain the process, effort and costs associated with re-using old buildings. She will also suggest some “next steps” that might be undertaken to jumpstart the rehabilitation of Hicks and Cutler. Water, once abundant and cheap, is poised to become the new oil as the entire world faces the reality of a decreasing supply of clean water. If we are to avert a devastating shortage, we must look at alternate water sources in the planning of new developments and management of existing densely populated regions such as the greater New York area. In her presentation Halina Steiner, MLA, will discuss the collaborative work her firm is involved in to improve water quality. Specific examples of stormwater management across scales, from watershed to localized capture will be detailed and projects shown will include Gowanus Canal Sponge Park, Alley Pond Environmental Center, HOLD System: Bronx River, and HOLD System: Flushing Creek. Presenter: Richard Arnedos, Landscape Architect, Horticulturist II, Nassau County Department of Public Works, Adjunct Professor, Farmingdale State College Department of Urban Horticulture and Design. Super storm Hurricane Sandy wrecked havoc on Long Island’s entire landscape. Many forest communities were severely damaged and countless private landowners, town, county and state government agencies still face monumental tasks cleaning up downed trees and debris and assessing the overall health of the forest. With every challenge comes an opportunity to think anew. In this presentation landscape architect Richard Arnedos will discuss the work his agency is doing to manage storm damaged county parklands and offer insights as to how many of Long Island’s diverse species of trees lend themselves to making products beyond firewood and wood chips. Rich will show examples of how to harvest and mill wood and design and create useful structures and furniture. 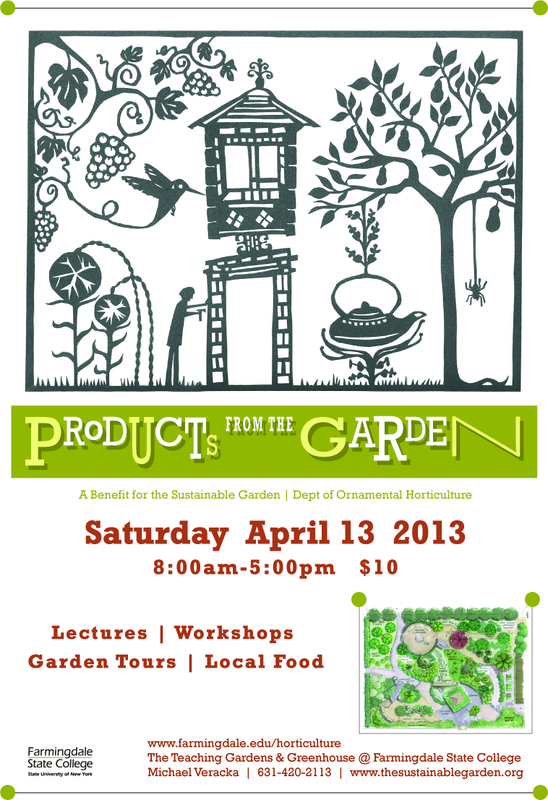 Description of presentation: This talk will demystify the what, how, and why of sustainable gardening. Topics include why we should plant for the long-term, how to make the best plant selections possible, how to manage invasive species, how to make the most of your lawn (regardless of its size), the importance of integrated pest management in fighting insects and pests, how to conserve water with proper irrigation, installing rain barrels and cisterns, and more. Grow More with Less is your complete step-by-step personal roadmap for sustainable gardening.